This website partially uses so-called cookies. Cookies do not cause damages to your computer and do not contain viruses. Cookies allow us to make our offer more user-friendly, more efficient and more secure. Cookies are small text files, stored by your browser on your computer. The most cookies that we use are so-called “session cookies”. They will be deleted automatically after the end of your visit. Other cookies remain on your terminal device. Those cookies enable us to recognize your browser on your next visit. You can adjust your browser that way in order to be informed when cookies are placed, to individually allow cookies or to generally exclude cookies in certain cases as well as to activate the automatic deletion of cookies when closing the browser. The deactivation of cookies may impair the functionality of this website. You may prevent the installation of cookies by adjusting the settings of your browser; however, if you do so, you may be unable to use all features of this website. Further, you may prevent the collection of data generated by cookies (including your IP address) and related to the use of this websites as well as the processing of such data by Google by downloading and installing the plug-in under the following link: tools.google.com/dlpage/gaoptout?hl=en. The provider of these websites automatically collects and stores information in log files which your browser automatically transmits to us, such as - browser type/version - used operating system - referrer URL - host name of the accessing computer - time of query. Those data cannot be associated with individual persons. A merging with other data sources does not take place. We reserve the right to retrospectively check the data if reasonable evidences concerning illegal use become known. All the information that the customer transfers will only be used at the online shop fonts4ever for processing the customer's orders. All information is handled in strict confidence. Information is only transferred to other parties (i.e. shipping companies) when it is necessary for the order processing. The order information will be encrypted and securely transmitted, we are not responsible for data security during the online transfer (e.g. due to a technical error of the provider) or for a potential criminal access to files of our internet presence by third parties. Customer log in information transferred to the customer on request is handled in strict confidence by the customer, because we do not take any responsibility for the use of this information. With judgement from May 12, 1998 »312 0 85/98 - Responsibility for links« the district court of Hamburg decided that one is responsible for the content of the linked web pages. This can only be avoided by explicitly dissociating oneself from the content of this pages. We therefore explicitly dissociate ourselves from the content of any linked web pages on this website. This statement is valid for all links on our web pages. »Petras Script«, the first digital script font created by the calligrapher Petra Beiße, has, for many years, met with worldwide success. Now the font is complemented with an alternate character set, which gives designers more flexibility and adds a personal touch to the font. 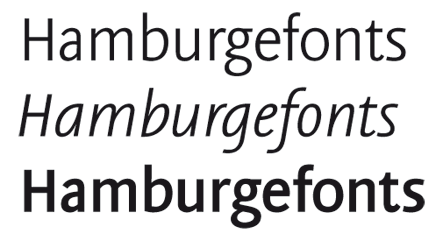 Furthermore Elsner+Flake extended the characterset of both weights to Europa Plus layout. Petra Beiße has resided for a long time in Wiesbaden, Germany, where she is working as a renowned calligrapher. It is rare that any of her scripts are transferred into digital format and sold worldwide as fonts. 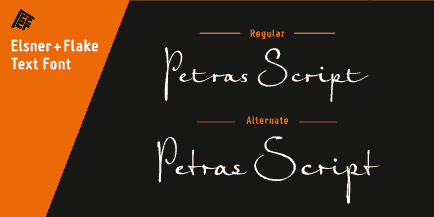 Because »Petras Script« became such a huge success, she decided to release Casanova Script Pro. Further information about Petra Beiße and her present workshops can be found under www.handlettering.de. In 2014, the TV Nord was revised stylistically and expanded to incorporate all (European-Latin languages). As part of this effort, further condensed cuts were added. This new design came into being as part of a complete overhaul of the visual image of the broadcasting station. This became necessary because, founded in 1954, it incorporated the stations of the East German states Mecklenburg-Vorpommern (1992) and Brandenburg (1997) after the re-unification of Germany. The Hamburg advertising agency DMC Group developed a new and unified image for the broadcasting station which is in existence to this day. The logotype was developed from the capitals of the font too. The typeface TV Nord relates to the design of the Trade Gothic and similar American sans serif typefaces of the early part of the last century. Its development concerns itself as much with good legibility for print, as it does for the reproduction on TV screens, which among others, is achieved through its high x-height. 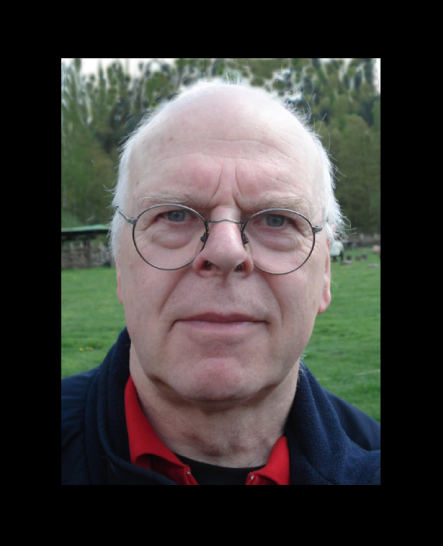 Our friend Hans Eduard Meier has passed away. The father of Swiss cursive writing, the Schweizer Schulschrift »Basisschrift« and »ABC Schulschrift« , is no longer with us. He passed away in his 92nd year after a life of great productivity. Following his training in typesetting and after a few semesters of studying Typography and Graphics he worked as a commercial graphic artist. From 1950 until his retirement in 1986, he taught Typography and Drawing at the Kunstgewerbeschule in Zürich. While he was teaching, he published a book in three languages: »Die Schriftentwicklung/The Development of Script and Type/Le développement des caractères« in 1959 and whose reissue by Niggli Publishers is still available. The Spanish edition is called »La evolución de la letra« and was published by Campgràfic Editors, Valencia, in 2012. Hans Eduard Meier gained his reputation with the development of the Sans-Serif typeface Syntax which, thanks to its roots in the Renaissance Antiqua, created a brave counter design to the then popular form concepts of Helvetica and Akzidenz Grotesk. The Syntax typeface, slightly tilted, and drawn in the tradition of the humanistic renaissance, entices not only because of its sympathetic, warm character, but it distinguishes itself by its clarity and readability. This is what made it a success and a stylistic leader for many of the type designs of the last decades. In the course of the development of the Schweizer Schulschrift, whose exclusive right of distribution he gave to us, I visited Hans in 2004 in Obstalden, where he then lived. He shared a small house with his wife Elisabeth in which a cobbler had once lived and worked. The house was »stuck« to a steep hillside and could only be accessed on foot from the road above. In this magical house, Hans showed me many details which he himself had restored with much love and expertise. His study was furnished with a daybed, a small desk and his computer work station on which he worked every day on his type designs up to the time when he moved to Horgen in 2013. When he wanted to relax, he looked out of the nearby window onto a series of waterfalls and the Churfirsten Mountains. In this manner he worked off and on, always following »his language of form« on different typographic ideas some of whose results can also be found in our type offerings. In his own personal style, with the same intensity with which he had restored his house, he developed the antiqua typeface Barbedor in 1984; for the Eidgenössische Technische Hochschule Zürich (ETH) the typeface Oberon in 1992; and for the International Typeface Corporation the ITC Syndor (1992). He designed a typeface for bank notes for the Swiss National Bank in 1994. Between the years 1995 and 2000 the Linotype-Syntax typeface families were created and, coincidentally, the original Syntax Grotesk was reworked. He designed the typeface Elysa, named for his second wife, for Elsner+Flake in 2002. As early as 2001 he began working on the development of an innovative typographic concept in order to retire the traditional »Schnürlischrift« which was then offered exclusively in Swiss primary schools and replace it with a new methodology of teaching and a language of forms which would build successively one upon the other. In this way an exclusive cooperation with Elsner+Flake came into being with the goal of offering user-specific variations and a number of ligatures for teachers and students. The typeface Gesta came out in 2004. It is supposed to function as a pattern for an antiqua which can be embroidered and which he designed for his daughter, Brita Meoli-Meier, a needle crafts teacher. The font version of the Gesta typeface was offered by Elsner+Flake in 2013. The last projects Hans Eduard Meier worked on were the tyefaces Meier Kapitalis and Parnassia (manufactured exclusively 2013 for hot metal matrices, see Parnassia »Sagenbuch«) as well as the Meier Sans in 2013 which he was not able to complete. ﻿Image 1: The last typeface by Hans Eduard Meier in collaboration with Elsner+Flake, Meier Sans, will now, unfortunately, remain unfinished. Hans Eduard Meier had planned to complete the circle of his typographic oeuvre with the Meier Sans and tie it to the Syntax typeface which was designed between 1968 and 1972. Image 2: The typeface Meier Kapitalis from the year 2012 was, except for the typeface Parnassia which was commissioned by the Offizin Parnassia in Vättis, the last typeface family created by Hans Eduard Meier. It was completed shortly before his death in July 2014 at the offices of Elsner+Flake. Image 3: The typeface family Parnassia for the Offizin Parnassia in Vättis consists of a Roman and Italic design. It was drawn by Hans Eduard Meier in 2013 as a pattern for the production of Monotype matrices. The design of the typeface Moskau Grotesk is based on the signage created for the Café Moskau in Berlin by the graphic artist Klaus Wittkugel in the beginning of the 1960s. The Café Moskau, across from the Kino International on Karl-Marx-Allee in Berlin Mitte was one of the prestige edifices of the former DDR (German Democratic Republic). Built in the early 1960s, it advanced over the years and changing social developments to a trademark building of the capital. The lettering display on the roof was created by the graphic artist Klaus Wittkugel (October 17, 1910 – September 19, 1985). He had been Professor at the School for Applied Arts in Berlin, and, in addition to the creation of many posters, book covers and postage stamps, he was responsible for the signage of the Kino International as well as for the complete graphic treatment for the Palace of the Republik. 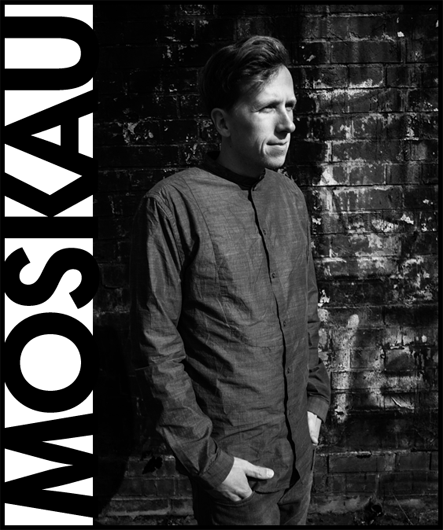 The signage for the Café Moskau with the words »RESTAURANT«, »CAFÉ«, »KONZERT« and »MOCKBA« set in capital letters, becomes the basis for the Moskau Grotesk which was developed by Björn Gogalla in 2013. This face should not be seen as an imitation. A few shortcomings were »fixed«. In favor of maintaining the core characteristics some unique features were, however, not relinquished. Lower case letters and the missing capital letters were designed from scratch. It is not surprising that the plain, unassuming geometrical direction of the basic character style forms a bridge to the architecture of the 1960s. Inspired by the then favored, diverse possibilities inherent in the architectural example and wall reliefs, two complimentary pattern fonts emerged. Björn Gogalla works as a freelance designer in Berlin and Thailand. His website is www.letteredit.gogalla.de on which he also offers his typefaces Flaco and Barklay. Under the heading »free font« you may download one test font and convince yourself of the quality of our product. »I created the Oberon in 1994 as the house typeface for the Institute of Computer Systems at the ETH in Zürich. Since here I had the opportunity to learn about designing typefaces with the help of a computer, I created this typeface as an exclusive for ETH. The Barbedor which is the first font I created at this Institute, and later also the Syndor which was a synthesis between the Syntax and Barbedor types, I had licensed to type foundries. Thus, the Institute had no typeface created by me for which they had exclusive rights. The Oberon typeface was given to the Institute for its own, exclusive use without having to take other type foundries’ license agreements into consideration. Today, ten years later, I have the right to license Oberon. The rights of the Institute are in no way impacted by this. The Institute continues to be able to use the typeface in any way it sees fit, and if needed, pass it on together with products of the Institute to third parties, but it may not use it for commercial gain. The Oberon typeface family was offered exclusively by Elsner+Flake in 2004. Under the heading free font you now have the opportunity to satisfy yourself about the quality of our typefaces and to test the functions of the font formats »OpenType«, »TrueType« and »Webfont«. The f4e FreeFont of the year is Bernhard Gothic EF Medium. With the free download you will receive an »OpenType« or »TrueType« file which includes a permanent print license for up to five users at one location or a »WebFont« with a Web License for one domain and up to 10,000 pageviews per month. In case you need an extended license, please contact us for further assistance. The FreeFont of the year 2015 is the Basisschrift®* by Hans Eduard Meier (dec. July 17, 2014). During the last ten years of his life, Hans Meier, together with Max Schläpfer, developed an innovative concept of a new Swiss Schulschrift (handwriting script for schools). His life’s work is crowned by the fact that now, since the fall of 2014, and beginning in Lucerne, this new didactic will replace the old Schnürlischrift in Switzerland. The version of the Basisschrift®, available from here, is the original version by Hans Meier. With the free download you will receive an »OpenType« or »TrueType« file which includes a permanent print license for up to five users at one location or a »WebFont« with a Web License for one domain and up to 10,000 pageviews per month. In case you need an extended license, please contact us for further assistance. *The brand name Basisschrift® and the design of the Basisschrift® are registered design and trademarks. Similar digital versions of the font have not been authorized by Hans Meier and may violate his rights. »In 2013, the anniversary year of Bodoni, a number of friends of cast letters, followers of hot metal type and book printing, met in Dresden on August 11, in the new home of the Offizin Haag-Drugulin in order to – as a basis for meaningful action – found the Society for the Black Art«. Here is an excerpt from the Founding Statement which has been sent to the founding members together with an invitation to the 2nd Founders’ Meeting and the 2nd Type Festival. While the first Type Festival was dedicated entirely to the 200th anniversary of the book printer and typographer Giambattista Bodoni (1740-1813) this year’s festival dedicates itself to two completely different alphabets: »Alte Schwabacher« and »Futura«. The daily program, as it did last year, consists of excursions, lectures, and presentations. The chairman, Professor Niels-Christian Fritsche, offers workshops together with students of the Offizin; Eckehart SchumacherGebler presents, based on original matrices, »The Touchable Schwabacher«; Professor Sybille Schmitz talks about »The Handset Type Workshop as part of Education«; and Horst Moser lectures on »Futura and its Creator, Paul Renner«. ﻿Image 1: Letters of the embellished Schwabacher from the collection of the Reichsdruckerei, about 1885. By kind permission by Eckehart SchumacherGebler. 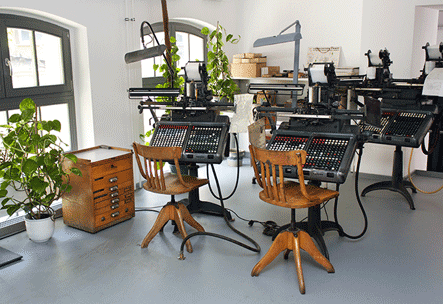 Image 2: Room with Monotype Typesetters in the former rooms of the VEB Typoart, Dresden. By kind permission by Eckehart SchumacherGebler. From Book to Street. Large-Format Typography from 1600 to 1920. 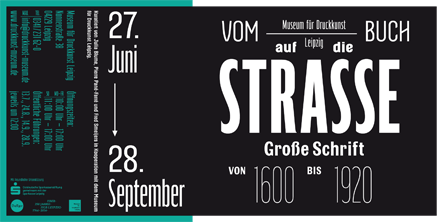 On the occasion of the 250th anniversary of the »Hochschule für Grafik und Buchkunst Leipzig« (HGB) – the Institute for Graphics and the Art of the Book in Leipzig – the Museum für Druckkunst – Printing Museum Leipzig – has mounted an exhibition »From Book to Street« to be shown from June 27 to September 28, 2014. Beginning in the 18th century, typography expanded increasingly beyond the confines of the book and began to determine the look of the city. Whether political or commercial, letters transported messages to the public on walls, kiosks and in shop windows. In addition to printed messages, hand-painted typography appeared on signs and on storefronts, street names were carved in stone or whole brick walls were covered with typographic inscriptions. These techniques in transposition, important developments in the printing industry as well as the influences of architecture and painting led to an extraordinary proliferation of letterforms in the 19th century. Under the guidance of Julia Blume, Professor Fred Smeijers and Pierre Pané-Farré (all of the HGB Leipzig) students who specialize in type design explored the Leipzig archives and libraries for supporting images that show the visual impact and the abundance of facets of type. Special emphasis was put on the era between 1600 and 1920. Placards, type specimen, post cards, printed matter, photographs, objects and films were chosen for this exhibit. Artifacts which closely relate to Leipzig received special attention. Another part of the exhibit concerns itself with the often used method for type rendering: stenciling. Visitors can try this reproduction technique themselves with the help of a re-constructed stenciling table. A selection of historical objects provides insights into the production and development of this manual technique. For students who specialize in type design, which is a profiled arm of the HGB Leipzig and which can look back to a history of 110 years, the exhibit makes it possible to achieve an insight into the unique work of the type designer for whom historical reflections take on such an important degree. Stadtgeschichtliches Museum, Deutsches Buch- und Schriftmuseum, Deutsche Nationalbibliothek, Stadtarchiv and Sächsisches Staatsarchiv Leipzig. Docents will conduct tours Sundays at noon: July 13, August 28, September 19 and 28, 2014. Exhibit times: Monday-Friday 10 a.m. to 5 p.m.; Sundays 11 a.m. to 5 p.m. Closed Saturdays. ﻿Image 1: Exhibit Flyer. By permission: Museum für Druckkunst Leipzig. 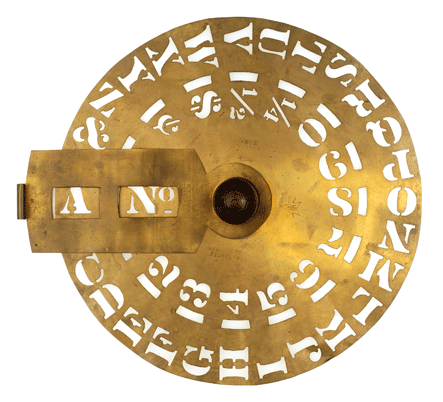 Image 2: Plate for Stencil Typefaces: Brass, New York Stencil Works, 1868-1871, Diameter 250 mm. By permission: Museum für Druckkunst Leipzig. From April 8 to June 8, 2014, the Graphics Gallery of the »Museum der Arbeit« in Hamburg will host an exhibition about Louis Braille who, in 1825, developed the typeface for blind people that was named after him. What Johannes Gutenberg did for seeing people, Louis Braille has done for the blind. 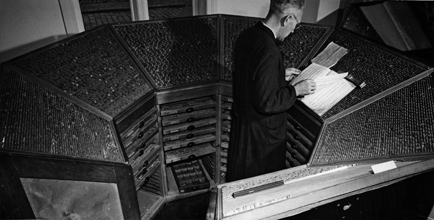 Moreover: while Gutenberg developed the technique which made it possible to reproduce texts created in an established typeface for larger editions, Braille created a new touchable type system about 200 years ago which gave blind people access to a comprehensive education. In cooperation with the »Blinden- und Sehbehindertenverein e. V.« (the Organization for Blind and Sight Challenged People), the »Museum der Arbeit« shows why the simple and ingenious invention by Louis Braille was able to succeed and why his typeface, consisting of six dots, remains the worldwide standard to this day. Louis Braille is only three years old when he injures his eye while he is playing with an awl. Both eyes become inflamed and two years later, he goes blind. As a ten-year old he is awarded a stipend to attend the »Institute for Blind Youths« in Paris. Here, the so-called »Nachtschrift« is taught. The Officer Charles Barbier de la Serre had developed an abstract set of signs made up from twelve punched dots which was used for the secret transferal of military information during the night. But the awkward touching from high to low made reading too difficult. 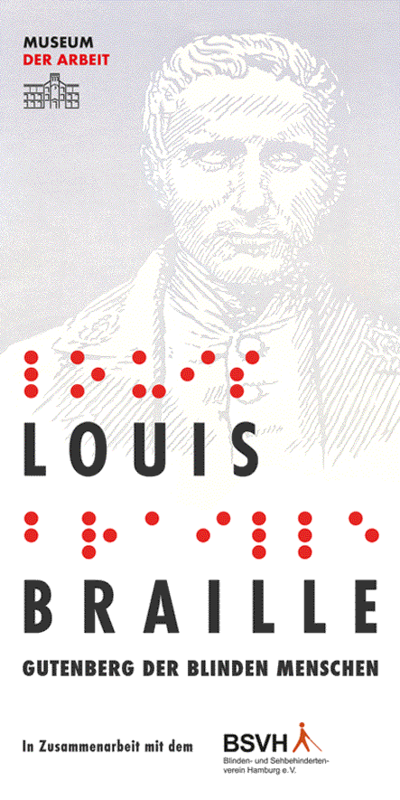 Louis Braille reduces the basic form to 6 dots, and already in 1825, at the age of 16, he has completed his alphabet. These signs are easily readable for blind people. Writing, also, is easy to do with the help of a tablet and punch. In this special exhibit »Louis Braille. The Gutenberg for the Blind« visitors will have the chance to try out different typefaces for the blind. 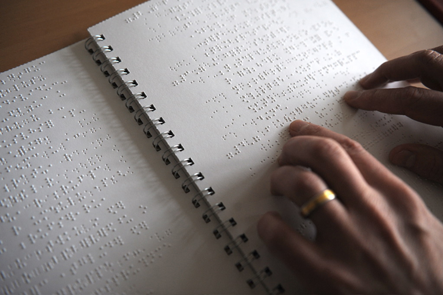 Furthermore, there will be examples of the helpful devices – from the groove-profile board to the dot-dot typewriter to the modern computer workstation – with which blind people from yesterday to today read and write the Braille type. The museum offers special guided tours for schools and other groups with practical options: Seeing visitors will be offered an introduction into the history of typography for the blind and can also try out writing on the groove-profile board. Blind and sight-challenged visitors can touch lead types in the workshop of the Museum and feel their impressions on heavy paper. April 28, 2014, 6:00 p.m.
May 19, 2014, 6:00 p.m. The Blind Witness. Helpless or Super Hero? With the idea that they might be able to exchange secret information, blind people were denied the right to have their own type for a long time. Yet to this day, many seeing people look at type for the blind as if it were a secret language. In the exhibition »Louis Braille. The Gutenberg of the Blind« Torsten Wolfsdorff of the Organization for the »Blind- and Sight-Challenged e. V.« and who is himself blind, talks about how the ingenious invention of six raised dots functions and how he uses it – from jotting down a shopping list to using his workstation. Following the lecture, the attendants can try out themselves how to use a typeface for the blind and the groove-profile board. It’s not that easy! 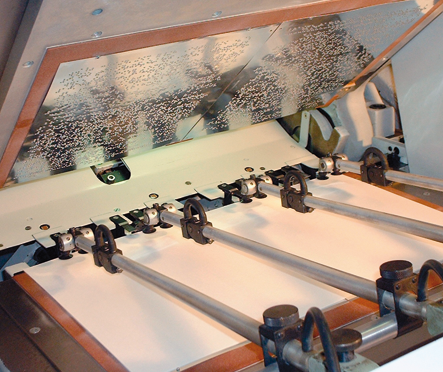 ﻿Picture 1: Braille printing machine. German Central Library for the Blind in Leipzig (DZB), under permission of »Museum der Arbeit«. Picture 2: Poster »Louis Braille. The Gutenberg for the Blind«. Under permission of »Blinden- und Sehbehindertenverein Hamburg e. V.«. Picture 3: Publication in braille. Blinden- und Sehbehindertenverein e. V.« (the Organization for Blind and Sight Challenged People), under permission of »Museum der Arbeit«. Our dear Hamburg friend and business partner Wolfgang Dutschke died on his 76th birthday on January 25, 2014, after a long illness. Wolfgang belonged among the pioneers of digital typography. His training as a typesetter in the fifties may not have been his first choice of a profession, but already during his apprentice years he was so taken by the subject that he enrolled at the University for Fine Arts in Hamburg to further his education. He was especially influenced by his studies with Richard von Sichowsky, the founder of the »Hamburg School.« After spending several years of training in Switzerland, he opened his own advertising agency in Hamburg. As much as he loved and lived his profession and micro-typography, as much he devoted his free time to the restoration of large French clocks. Here, as well, he was guided by his dedication to precision and attention to the smallest detail in order to reach perfection at the highest level. Wolfgang leaves us with his »Lexikon der Typography« (The Dictionary of Typography) which, unfortunately, he could not finish because of his advancing illness. We are glad that we still have the Diamanti Typeface catalogs in our archives and shall be glad to forward them to interested parties. The silent film The Cabinet of Dr. Caligari (1920) is undoubtedly one of the breathtaking milestones within the German Expressionist Movement, a time of extraordinarily creative works of art as a reaction to a world in rapid change. 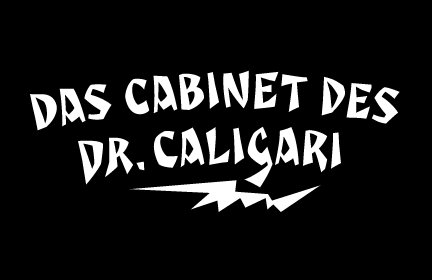 The original intertitles of Caligari were worked out by the set designers (and painters) Walter Reimann, Walter Röhrig, and Hermann Warm, using a unique expressionistic language of form for dramatic and iconic lettering. When in 2010 KOMA AMOK’s Joerg Ewald Meißner and Gerd Sebastian Jakob were commissioned by the Institut Mathildenhöhe Darmstadt and publisher Hatje Cantz to design the catalog for the exhibition The Total Artwork in Expressionism—showing works of art, architecture, film, literature, theater, and dance—it was soon perfectly clear that a new typeface, inspired by the Caligari intertitles, should speak for all the expressionistic arts. An intense process of research and analysis began. The original letters of the Caligari intertitles were individuals on their own. Furthermore, each of the three title designers had added his specific approach to the basic Caligari type style. From hundreds of different As to Zs a choice had to be made, which should be THE characteristic Caligari letter for a digital typesetting font. Finally the chosen letters were cut and drawn again, missing letters were added according to the formal principles, all-in-all 1000 glyphs were digitised to complete a useful OpenType font ready for use. When in the autumn of 2010 the exhibition started successfully with great media interest, the posters all over Darmstadt announced »You must become Caligari!«—set in the brandnew typeface. The font Caligari Pro offers alternative forms for every letter and a whole bunch of ligatures, thus creating an expressive, individual image of headlines and text. By using included Stylistic Alternates the image will get even more vivid. Caligari comes with a complete set of expressionist ornaments and true old style figures—thus the heyday of the Expressionist Movement and the era of the silent films can be revived typographically by the means of today: »Express Yourself!«. At first glance, Materia shows a contemporary flair, combining pure, strong geometrical form with a subtle, distinct appearance. Actually, the postneutral design was inspired by lettering from the turn of the 19th to the 20th century that still can be found in the East of France. While its formal origins date back as far as this, revived e. g. by the constructivists into the nineteen twenties and later on by Dutch information designer Wim Crouwel in the nineteen-sixties, the visual language of Materia still speaks of »future«. Following a minimalistic concept the font is formally built on a grid. Wherever optical curves are needed for a smoother, more comfortable shape of letters than a simple rectangular block, diagonals cut off the edges—like a diamond is cut to achieve more beauty. Thus headlines and texts set in Materia are given a certain »edgy« feeling, whereas their tonality is still kept well-balanced, keeping concentration all on information in a nonconformist way. 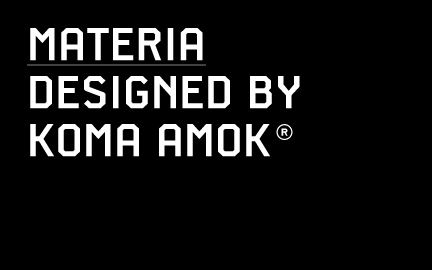 Materia comes in eight styles, from elegant Thin to attention-forcing Ultra. Even a regular Italic is available, following the classic type-setprinciple. Two of the styles are explicitly designed for display use, Shadow and Code. Both are ready for combinations with Bold or each other respectively, the layering of Shadow and Code e. g. allows astonishing effects of highlighting within the letters. For OpenType-users Materia is a real Pro, containing accented Latin letters for over 70 languages, small caps, old style, tabular and lining figures and special condensed titling all caps for cases in which space is all that counts. 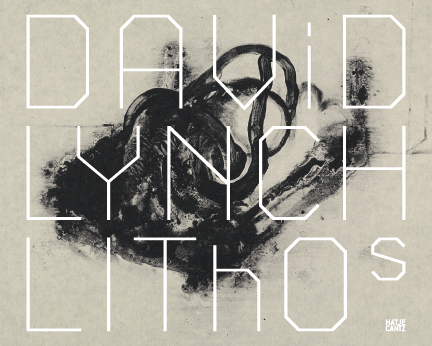 How useful all of the above mentioned is may be seen in the book David Lynch—Lithos, designed by KOMA AMOK, published in 2010 by item éditions, Paris, and Hatje Cantz, Germany, which was typeset completely in Materia. Thus far, the company provided webfonts upon request only (fonts4web). Now, the libraries of Elsner+Flake, Scangraphic, Apply Design Group, Typoart and TypeShop are in the process of being expanded and will also be offered for licensing via the Elsner+Flake Onlineshop www.fonts4ever.com. You can find out which fonts are presently available by klicking on »webfonts« on the menubar of the home page or the button »fonts4web« in the »advanced search« option of the particular website. Webfonts are also marked as such on the lists of fonts provided for the individual libraries. Here, you can chose a package with the three fonts4web formats .woff, .eot and .svg directly on the pull-down menu and place it into the shopping cart. Css- and htaccess-data will be provided for these web fonts. This data allows the fonts to be incorporated into your website. If you want to check the quality of the rendition, you can do so on the detail page of the particular font. Here you will find, among others, the character complement of the web font in question. If you select the menu point Browser View you can view the webfont as it appears in the chosen browser. The first view shows the range of sizes recommended by Elsner+Flake. If you need to see further pixel sizes for specific applications, you can klick twice to access the second level. With its extended complement, the comprehensive redesign of Bank Gothic by Elsner+Flake offers a wide spectrum for usage. After 80 years, the typface Bank Gothic, designed by Morris Fuller Benton in 1930, is still as desirable for all areas of graphic design as it has ever been. Its usage spans the design of headlines to exterior design. Game manufacturers adopt this spry typeface, so reminiscent of the Bauhaus and its geometric forms, as often as do architects and web designers. The creative path of the Bank Gothic from hot metal type via phototypesetting to digital variations created by desktop designers has by now taken on great breadth. The number of cuts has increased. The original Roman weight has been augmented by Oblique and Italic variants. The original versions came with just a complement of Small Caps. Now, they are, however, enlarged by often quite individualized lower case letters. In order to do justice to the form changes and in order to differentiate between the various versions, the Bank Gothic, since 2007 a US trademark of the Grosse Pointe Group (Trademark FontHaus, USA), is nowadays available under a variety of different names. Some of these variations remain close to the original concept, others strive for greater individualism in their designs. Because of the huge success of this type design, which follows the design principles of the more square and the more contemporary adaption of the already existing Copperplate, it was soon adopted by all of the major type and typesetting manufacturers. Thus, the Bank Gothic appeared at Linotype; as Commerce Gothic it was brought out by Ludlow; and as Deluxe Gothic on Intertype typesetters. Among others, it was also available from Monotype and sold under the name Stationer’s Gothic. 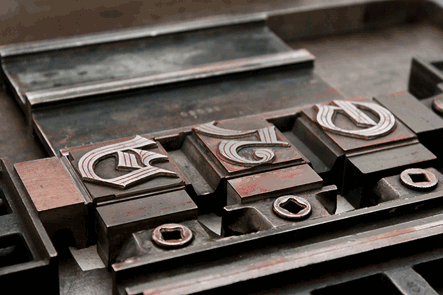 In 1936, Linotype introduced 6pt and 12pt weights of the condensed version as Card Gothic. Lateron, Linotype came out with Bank Gothic Medium Condensed in larger sizes and a more narrow set width and named it Poster Gothic. With the advent of photoypesetters and CRT technologies, the Bank Gothic experienced an even wider acceptance. The first digital versions, designed according to present computing technologies, was created by Bitstream whose PostScript fonts in Regular and Medium weights have been available through FontShop since 1991. These were followed by digital redesigns by FontHaus, USA, and, in 1996, by Elsner+Flake who were also the first company to add cursive cuts. 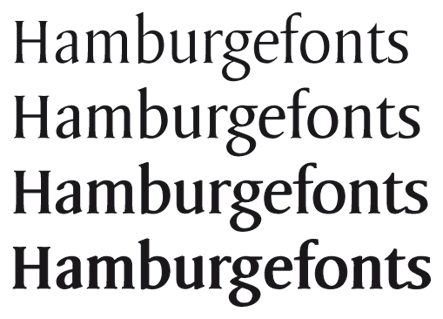 In 2009, they extended the family to 16 weights in both Roman and Oblique designs. In addition, they created the long-awaited Cyrillic complement. In 2010, Elsner+Flake completed the set with lowercase letters and small caps. Since its redesign the type family has been available from Elsner+Flake under the name Bank Sans. »The Society of Typographic Aficionados (SOTA) is now accepting programming proposals for its thirteenth annual conference. TypeCon2011 will be held July 5th – 10th, 2011 in New Orleans. Under the motto »Surge« an affordable program will be offered designed for type makers and type users from all walks of life«. This announcement was posted February 14, 2011 by board member Grant Hutchinson. The board of SOTA is currently reviewing proposals for contemporary and historical presentations and panel discussions, focused hands-on workshops in both the digital and non-digital realms, and a variety of programming for the Type & Design Education Forum and other special events. Topics for presentations at TypeCon cover a broad range of interests, including typography, type design, font production, graphic design, new media, printing history, calligraphy and hand lettering, the book arts, advertising, type in motion, literacy, type sales and marketing, legal issues, type and design education, and other related areas. In 2007, Christian Büning founded www.lernplakate.de (»Posters for Teaching«), an internet platform offering interesting posters in support of teaching and education. We would like to draw attention specifically to the »Typographic Calendar 2011«, »The Anatomy of Letters« and »Letter Foundaries in Germany«. As of January 1, 2011, the company, presently functioning under the name »Lernplakate.de, Fachverlag für Schaubilder und Übersichten«, will be known as »Plakatverlag UG & Co KG« and will be managed by the network executive Jan Rodorf and Christian Büning. I would rather not know how many good poster ideas linger in dark desk drawers and never see the light of day on a sheet-fed offset plate. Today, we are happy to announce the salvation for these ideas: designers can now publish their poster designs at www.wandformate.de and make money without having to adhere to the restrictions of a minimal print run. By using wandformate.de, they can even go a step farther: because of the close relationship with Lernplakate Specialty Publishers, a one-off print can quickly turn into a print run of any size. If a poster turns out to be successful, it can be made public by Lernplakate Publishers. This way, designers not only have their own unique publications, but if appropriate, can easily make them available throughout the European marketplace. Give your ideas the light of day! Show us your design via www.wandformate.de. We look forward to seeing your ideas. We like this idea very much and are interested in seeing how wandformate.de will develop in the future. 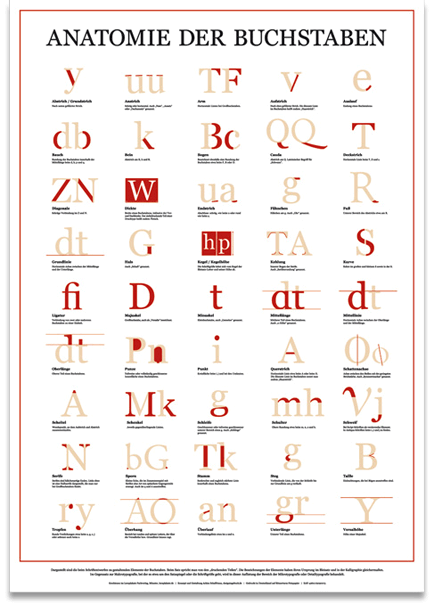 ﻿Poster »The Anatomy of Letters« by Achim Schaffrinna, 70 x 100 cm. From January 11 to March 6, 2011, the Museum der Arbeit, Hamburg, Germany will show, for the first time outside of Glückstadt, the »Chinesische Zirkel«, together with photos by Candida Höfer and August Sander. The Printing Company J.J. Augustin of Glückstadt will present a unique worldwide phenomenon, based on its »Chinese Circle« – the setting of Chinese ideographs on a circle. Since hot metal type is no longer in use, The Museum der Arbeit will show it, for the first time outside of Glückstadt, together with photography by Candida Höfer and August Sander and a film about the fate of the apprentice Jimmy Ernst. The Augustins were able to help the son of Max Ernst to flee to the USA in 1938. Events at the exhibit »Zwiebelfische«: The documentary »Zwiebelfische – Jimmy Ernst, Glückstadt–New York« was awarded the prize for the best documentary film at the Northern German Film Festival in November 2010. Ulrike Haage received first prize for the best movie score. The movie will be shown every day at 3 p.m. (60 minutes; group showings can be arranged). »Zwiebelfische«, Sunday, January 16 and 23, as well as February 6, 13, and 28, 2011, 1 p.m.
»Schrift ist ein Abenteuer« (Typography is an Adventure) – Imprimerie Nationale Paris, Sunday, January 30, 2011, 1 p.m.
»Rendezvous of Friends« – A Film about a Picture and its History: Sunday, February 20, 2011, 1 p.m.
Finissage: a Piano Recital by Ulrike Haage in the »Chinese Circle«: Sunday, March 6, 2011, 1 p.m.
﻿Picture 1: Portrait Jimmy Ernst, 1939, from the collection of Ms. Leonora Carrington, Max-Ernst Museum Brühl © Museum der Arbeit. Picture 2: Chinese Circle 1926, containing 6000 Chinese characters, photograph dated 1938 from the archive of Druckerei J.J. Augustin © Museum der Arbeit. The 7th German Letterpress Exhibition will take place on January 15 to 16, 2011 at the Museum der Arbeit in Hamburg. 50 book designers from Germany and abroad will show their printed treasures at The Art of the Book Printing Exhibit and offer them for sale. Press proofs, art books, binders, books as original graphics etc. will be presented which will give the viewer a multi-faceted picture of the liveliness and creativity of the book scene. Additionally, visitors will be given introductions into the world of the printing trade, the artistic design of books, as well as the manufacture of books and paper. The staff of the museum will demonstrate book printing, hot metal type founding, hand and machine printing processes, the cutting of wood types and the asembly of chases on historical machines. The type designer Wang Ning from Janjing will present a masterful exhibition of traditional Chinese calligraphy and will inspire observers to pick up a brush themselves. The exhibit will be open from 10 a.m. to 8 p.m. on January 15th, and from 10 a.m. to 5 p.m. on January 16th. Further information is available at www.buchdruckkunst.de. This month, the autobiography of József Molnár was published in Hungarian in a limited edition of only 50 copies. 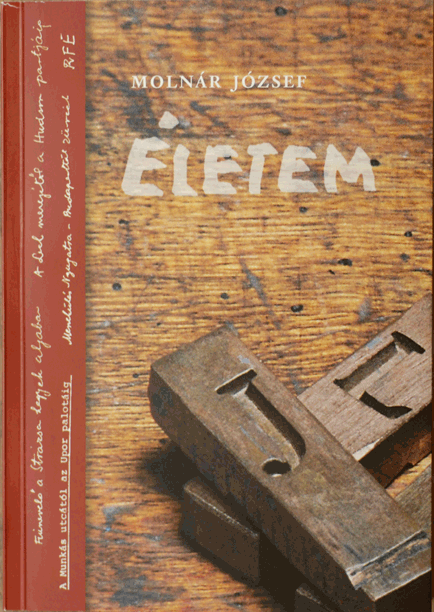 (Látóhatár – A Journal for Literature and Politics) with which he remained involved until 1989. In 1963, his publishing house »Aurora« began publishing the books of a number of Hungarian writers. Because he had a special love for the types of the Hungarian Nicolas Kis (1650–1702) he founded the »Misztótfalusi Kis Miklós Múzeumi Alapítvány«, and, in 1991, became co-founder of the museum in Misztótfalu. 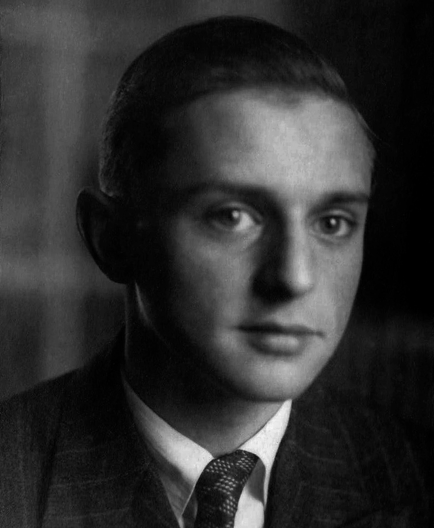 The recently published autobiography decribes Molnár’s life. He spent his childhood and his school years in Esztergomtábor. Hungry for education József enrolled in an educational institution for boys. For the extraordinarily gifted but poor boy, this is the only place where he can learn. In Esztergom he meets Géza Féja. In his youth and during his years of education, he discovers his love for literature and politics. 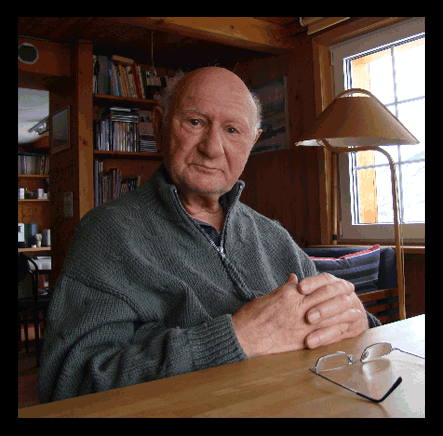 He talks about his escape from Hungary in 1948 and about his life and work in exile in the United States in the 50s. ﻿Bookcover with original copper matrices by Nikolas Kis. Futura®, designed 1926 by Paul Renner is now titel and topic of a breathtaking musical. Visit Pasadena, CA or New York to be witness of this unique event. A shared world premiere with Portland Center Stage and The National Asian American Theatre Company of Jordan Harrisons musical Futura® raises the question »Can a Font Change the Future?« Be there and listen to a lecture with the topic »From Pen to Pixel – the History of Typography«, which becomes a breathtaking thriller. Boston Court, Pasadena, CA until November 14, 2010 and TBG Theatre, New York until November 13, 2010. Since January 1, 2010 new regulations have been instituted for clients from non-German European Union countries. As of January 1, 2010, based on a change in business law, it is obligatory to include the added value tax identification number (VAT Number) on any order you place with a German company. If this number is not included or if there is a mistake in the number, your invoice will be increased by 19% (German VAT). If you do include your correct added value tax identification number you will not be charged the 19%. The added value tax identification number you indicate will be checked automatically by the Central Federal Office for Taxes for its correctness. You can also contact the German chamber of foreign trade for further information. Custom Fonts – now also online! Fonts4ever Onlineshop offers new functionality!